Shulamit Ran began composing songs to Hebrew poetry at the age of seven in her native Israel. By nine she was studying composition and piano with some of Israel’s most noted musicians, including composers Alexander U. Boskovich and Paul Ben-Haim, and within several years was having her early works performed by professional musicians, as well as orchestras. She continued her studies in the U.S., on scholarships from the Mannes College of Music in New York and the America Israel Cultural Foundation. Her music has been played by major orchestras including the Chicago Symphony, the Cleveland Orchestra, the Philadelphia Orchestra, the Israel Philharmonic, the New York Philharmonic, the American Composers Orchestra, and the Jerusalem Symphony. Maestros Daniel Barenboim, Pierre Boulez, Christoph Von Dohnanyi, Gustavo Dudamel, Zubin Mehta, Gary Bertini, Yehudi Menhuin, David Shalon, and various others, have conducted her works. 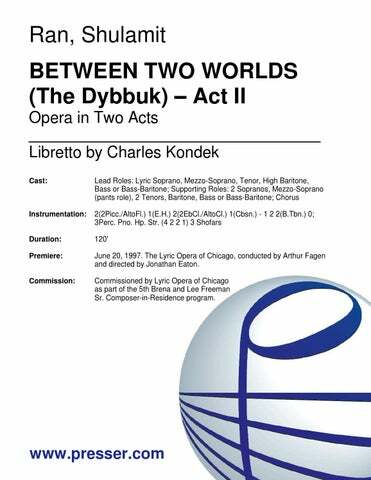 She also served as Composer-in-Residence with the Chicago Symphony Orchestra (1990-1997) and with the Lyric Opera of Chicago (1994-1997), the latter culminating in the performance of her first opera Between Two Worlds (The Dybbuk). In recent seasons Shulamit’s second string quartet (Vistas) and her third quartet (Glitter, Doom, Shards, Memory) have received multiple performances by the Juilliard Quartet and the Pacifica Quartet respectively, in major venues in North America, Europe, and Asia. 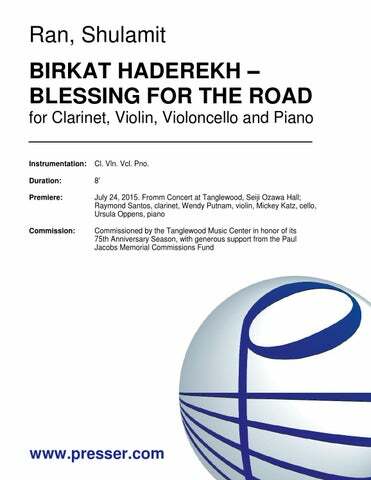 Birkat Haderekh – Blessing for the Road, a chamber work commissioned for the 75th anniversary of the Tanglewood Music Festival, received its premiere in the summer of 2015, and Stream, commissioned by the Philadelphia Chamber Music Society for its 30th anniversary season for the Brentano Quartet with clarinet virtuoso Anthony McGill, was premiered in April 2016, followed in the summer of 2016 by the premiere of Love’s Call for SongFest’s 20th anniversary. 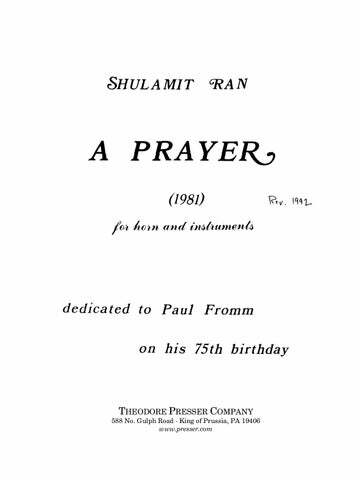 Among long-range compositional projects Shulamit Ran is now composing Anne Frank, an opera based on a libretto by Charles Kondek to be produced and premiered in the fall of 2020 by the Indiana University Opera and Ballet Theater, Jacobs School of Music, conducted by Arthur Fagen. Along with winning the Pulitzer Prize, she has been awarded most major honors given to composers in the U.S., including first prize in the Kennedy Center-Friedheim Awards competition for orchestral music, two Guggenheim Foundation fellowships, grants from the N.E.A., the Koussevitzky Foundation at the Library of Congress, Chamber Music America, and many more. The recipient of five honorary doctorates, Shulamit Ran is an elected member of the American Academy of Arts and Sciences and the American Academy of Arts and Letters. In 2011 she was the Paul Fromm Composer-in-Residence at the American Academy in Rome. She recently retired from the University of Chicago, where she taught since 1973, and where she was the Andrew MacLeish Distinguished Service Professor in the Department of Music, serving also as Artistic Director of Contempo (Contemporary Chamber Players). Ran has guest taught in many settings. In 1987, she was Visiting Professor at Princeton University, and in 2010 she was the Howard Hanson Visiting Professor of Composition at Eastman School of Music. Her numerous residencies in festivals and summer programs across the U.S. have included the Tanglewood Music Center, the Aspen Institute, Yellow Barn, the Steans Institute at the Ravinia Festival, Wellesley Composers Conference, and many more. She also served as music director for “Tempus Fugit,” the International Biennial for Contemporary Music in Israel, in 1996-2000. In the summer of 2018 she was composer-in-residence with the Marlboro Festival as well as at the International String Quartet Competition and Festival in Banff, Canada. Her works are published by Theodore Presser Company and by the Israeli Music Institute and recorded on more than a dozen different labels. Fanfare for Brass and Percussion 7:00 4Tpt., 6Hn., 3Tbn.(B.Tbn. ), 2Tu., Timp., 3Perc. for Two Quintets and Piano 22:00 1 1 2 1 – 1 2 2 0; Pno. (Concerto da Camera III) 19:00 2(dbl. AltoFl., Picc.) 0 2(dbl. 2B.Cl.) 0 Sop.Sax. – 0 0 0 0; 1Perc. Pno. Vln. Vcl. 25:00 2 2 3 2 – 4 3 3 1; Timp. 3Perc. Pno. Str. 22:00 3(Picc./A.Fl.) 2(E.H.) 3(EbCl./2B.Cl.) 3(Cbsn. )- 4 3 3(B.Tbn.) 2; Timp. 5Perc. Pno. Cel. Hp. Str. 34:00 2(Picc.) 2(E.H.) 3(2EbCl./A(Cl./B.Cl.) 3(Cbsn.) – 6 4 3 1; Timp. Perc. Str. 12:00 2(dbl. Picc.) 2 2 2 – 2 2 1 0; Timp. Perc. Cel. Str. 12:30 3(Picc.) 3(E.H.) 3(E-flat Cl. B.Cl.) 3(Cbsn.) – 4 3 3 1; Timp. 5Perc. Pno. Str. for Piano and Orchestra 12:00 Solo Pno. ; 4 2 4 3 – 5 4 3 1; Perc. Str.or 2 2 2 2 – 4 2 3 1; Perc. Str. Concerto for Clarinet and Orchestra 15:00 Solo Cl. (B-flat, A); 2 1 2 2 – 2 2 2 0; Timp. 3Perc. Str. for Cello and Orchestra 23:00 Solo Vcl. ; 2 2 2 2 – 2 2 2 0; Timp. 2Perc. Str. 32:00 Solo Vln. ; 2(dbl. Picc.) 2 2(dbl.EbCl. / B.Cl.) 2(dbl.Cbsn.) – 2 2 2 0; 2Perc.(Timp.) Cel. Str. For a Flautist with Orchestra 16:00 Solo Fl.(dbl. Ampl.AltoFl./Picc. ); 2(dbl.Picc.) 2 2(dbl.B.Cl.) 2 – 2 2 2(B.Tbn.) 1; 3Perc. Str. 18:00 Sop. Solo(Amplified); 2Fl.(Picc./A.Fl.) 2Cl. (EbCl./B.Cl.) Sarrussophone, Bsn. Hn. Tpt. Tbn. B.Tbn. 2Perc. Pno. 2Vln. Vla. Vcl. 6:00 Mezzo Sop. ; Fl. Hp. Str. for Chorus and Orchestra 7:00 SATB Chorus; 3(Picc.) 2 2(dbl. A Cl. / Eb Cl.) 2 – 4 3 3(B.Tbn.) 0: Timp. 4Perc. Str. …Ran’s music was gloriously human, whether slow or fast, solo or ensemble. Within the parameters of her style, she has written with the same sense of humanity found in Mozart’s most profound opera arias or Mahler’s searching symphonies… Ran’s music had the shape and the build to an emotional peak that great speakers exploit so effectively. She has a distinct artistic profile, based on the same things that distinguish all the great composers of the past, the superior quality of her musical imagination and artistic invention. …She firmly grasps a principle that makes all the difference in how contemporary music hits the listener’s ear. She genuinely seems to want her audiences to follow her train of musical thought. Shulamit Ran’s smart, sinewy music is the genuine article. Its tone of intelligence is congruent with its sense of aliveness, necessity, soul. … a powerful 20+ minute, four-song cycle based on poems from Sylvia Plath’s Winter Trees. Yes, it is Sylvia Plath, and there is gloom and doom, but this work is too good to be ignored. It wil grab and hold your attention. 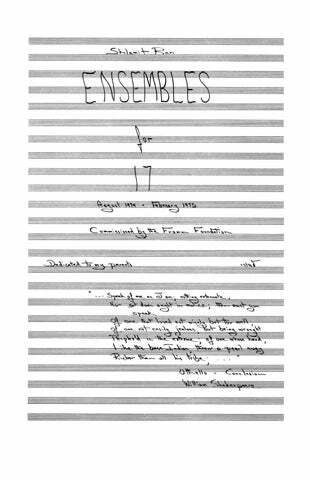 Diane Ragains’ sung, half-spoken and spoken delivery of the text is at times blood curdling, and throughout this work is heard a committed and virtuoso performance by this trio … one of the best large works in the soprano/clarinet repertoire. Ran draws you into the bleak, pained, uneasy imagery of the Plath poetry in a way that makes you feel at once assaulted, ennobled, and spiritually cleansed. …a highlight of the concert. It is a potent tale, and the libretto is nicely rendered in a singable poetic style… Ms. Ran, the 1991 Pulitzer Prize winner, is unquestionably a gifted concert composer, and her orchestra writing is the real glory of this opera… Wonderful colors emerge from the pit… Leitmotifs and musical themes are assembled with great sophistication. …impresses with its strength of expression… The orchestral accompaniment plays ecstatic accents and at the same time sets the rhythm for the impressive vocal lines. On top of this, there are elements of folklore and musical passages of the Jewish liturgy. Between Two Worlds is an inspiring opera… A moving experience! …an impressive piece on several levels. Musically, it has the vivid orchestral color and highly charged vocal writing so typical of Ran, winner of the 1991 Pulitzer Prize for music… and Ran’s score ranged easily from cheery klezmer-shaded tunes to austere but compelling love duets… unmistakably a 20th century work, though anyone expecting unrelenting dissonance or constantly high decibel levels would be disappointed. “Between Two Worlds” is above all a compelling story, not a polemic for a given musical style. …it has a celebratory quality, captured in both the vivid solo writing for each instrument and the stream of brief dialogues between them. 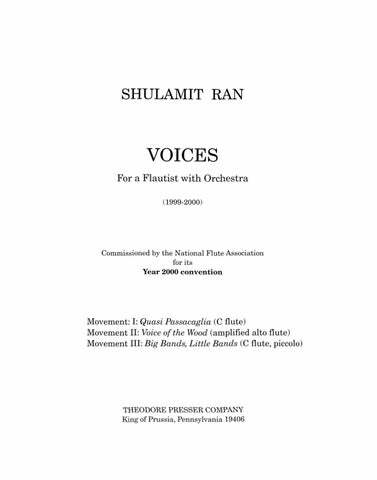 Ran’s “Concert Piece for Piano and Orchestra” is not a lengthy work, but it packs quite a wallop… The orchestration is imaginative and the piano part is extremely brilliant, with several big cadenzas, much rapid, scampering, highly percussive passage work… This piece, though short, is large in emotional scale… the extroverted quality of this vivid piece won for it a warm reception last night. 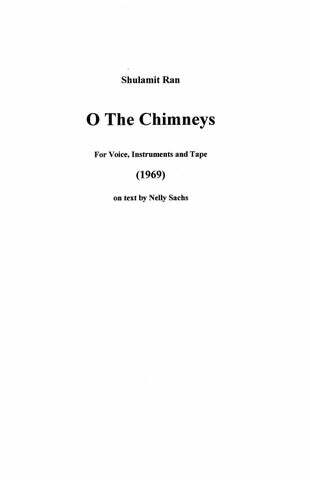 Woodwind quintets everywhere should be eternally grateful to her for producing a work so refreshingly free of the cliches of the genre. The work is essentially lyric-dramatic in spirit… This is music that clearly repays careful study. It has substance, and it is not afraid to be adventurous. Every measure…is charged with dramatic intensity… Forceful, compelling, beautifully wrought music: here is a new piece one would very much like to encounter again. 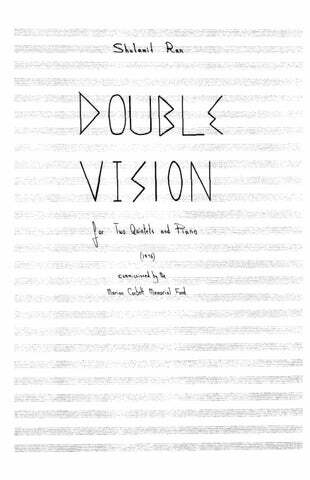 …runs through a gamut of passions and techniques, with an extended passage that reaches volumes not normally associated with the flute. Mimi Stillman gave it a hypnotic performance – the musical equivalent of a great actor declaiming a famous speech. 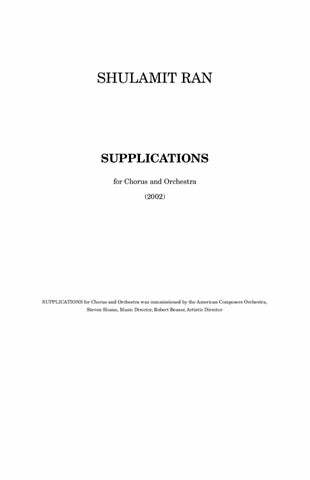 …a score of remarkable beauty, passion and formal clarity, and one that any cellist would be glad to learn. Ran’s quartet is admirable for its emotional directness. It is almost Romantic in its clarity of gesture. There is never a haze of sound … Ran also has a keep sense of sonority, which is explored effectively throughout the piece. …a fantastic, fantastic quartet. [Ran] really put her all into it. There is a wonderful structural arc. She really has something to say in the piece and through the music, and it’s written so well. It’s really a gratifying experience. …suspensful and emotionally charged … While Ran’s work is not specifically programmatic, it expresses the unmistakable emotional arc that parallels the German-Jewish experience of Nussbaum’s era, from relative normalcy through intimidation, gothic absurdity and shock, leading to a grave contest between terror and resolve, and a final catharsis of extraordinary sdaness and impact. “Grand Rounds” convey[ed] a sense of celebration, though not in overbearing ways. Instead, she [Ran] brought forth a vast range of color from a rather unconventional band: The Grossman Ensemble features Chicago’s Spektral Quartet at its core, plus winds, horn, dual percussionists, harp and piano. Ran used this palette to pen a readily accessible score that was as transparent in texture as it was lucid in tone. The joyful tintinnabulation of two mallet instruments spoke softly, as did long-held notes from flute and alto saxophone. Musical events came swiftly, the piece gaining animation and rhythmic momentum over time. 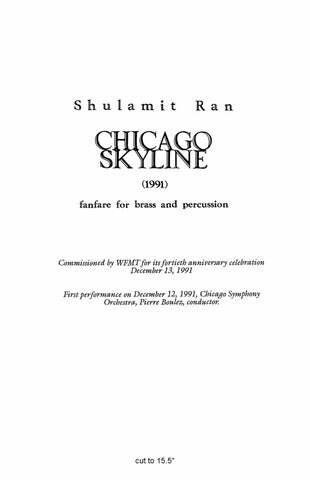 Ultimately, Ran reminded listeners that it’s possible to employ a relatively large ensemble in ultra-economical ways, while still achieving a brilliant timbral array. …Convivial bonhomie […] Ran efficiently works all members of what she called the “fixed-sized mini-orchestra” into the fabric as the music flits from section to section. Scored with Ran’s usual facility, Grand Rounds performed its celebratory function admirably. …a terrific piece that builds off the 19th-century legacy of the violinist as solo star. In three movements, the music explores some of the classic flavors of violin playing—the infernal (with a quick, cheeky quote from “L’Histoire du soldat”), dance music, and the pure structuring of music through melodic lines and arpeggiated chords. …the piece is luxuriant in its sounds and materials. 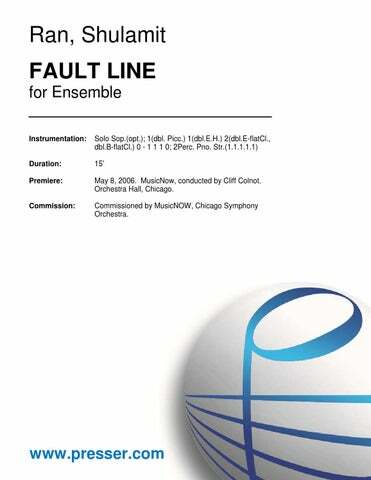 …brilliant orchestration technique … a rich melodic gift, that spins out arabesque like tendrils of blossoming vines … a capacity to keep the music moving … The music is always advancing dramatically, and one eagerly follows its course, but that momentum comes through large-scale “breathing” of the orchestra, not its dancing. There’s no mistaking that this is a work of brilliance and upheaval. …iridescent textures buzzingly suggestive of the Thousand and One Nights. …one hopes it finds the wide public it deserves. 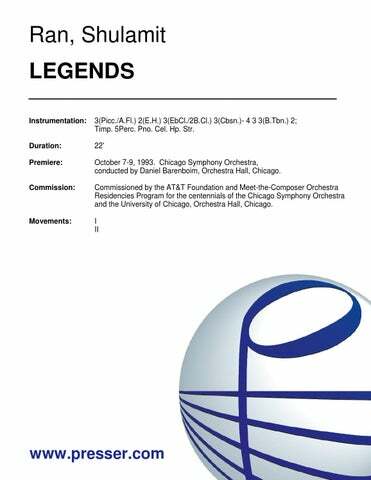 “Legends” means to evoke a mystical, timeless aura, and it achieves that timeless quality without resource to the obvious orchestral effects such evocation would invite. Ran’s ideas and gestures carry within them the seeds of their own development, and she compels us to follow their evolution through a two-movement quasi sonata lasting about 20 absorbing minutes. …With its Sephardic echoes along its vast harmonic palette, the music boasts vivid links to the composer’s homeland – a legendary, timeless cycle. The two movements are natural, even inevitable complements, bound by precise structural components and each sumptuously orchestrated. The lower winds and brass (bass clarinet, paired tubas, etc.) plus touches of muted trumpet, celesta and great washes of percussion create an alluring swirl of intricate sonorities. A characteristic blend of lyricism and academic modernism. …the landscape shifted from curving lines to bright, crisply articulated statements, then again to melismas that wiggled and then disappeared like a wisp of smoke. 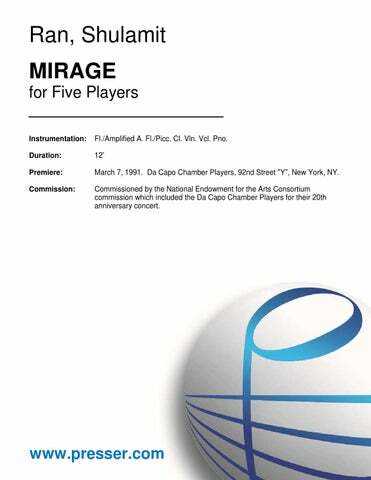 “Mirage,” imbued with the composer’s characteristic brand of dissonant lyricism, captured the imagination. The writing is spiky but ineffably lovely, dominated by purling flute melodies over still-toned backgrounds. 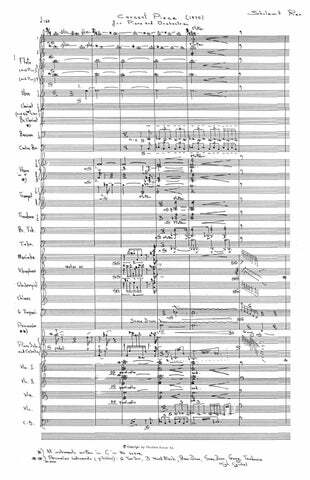 Ran clearly indicates the intended nature and mood of the piece with score markings such as ‘supple’, ‘with growing passion’ and ‘gruff”. The performer is required to convey a wide range of moods and tonal colours, and must be capable of executing the variety of technical challenges which the piece presents. Ran effectively portrays the ‘storm’, with sections to be played ‘ferociously fast’ and others in a ‘sunny’ manner. 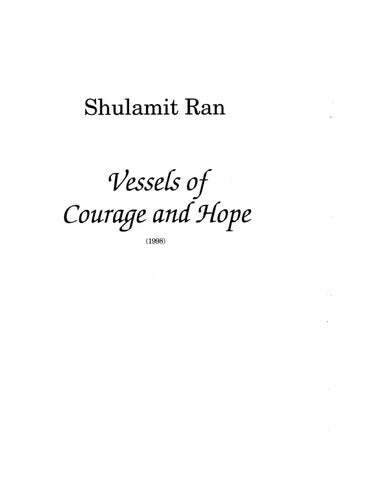 Shulamit Ran has written a detailed piece with wonderful character, suited to the advanced violinist. …a veritable showpiece for the instrument and a worthy addition to its limited repertoire. …Shulamit Ran’s haunting “Soliloquy”…captures the composer’s fresh, subtle spicey approach to tonality. Ran found the same virtues in clarinet tone—playful and soul-searching by turns—that Mozart and Brahms did … though not in [a] traditional language. …the four-movement “Vistas” turned out to be an important discovery — full of anguished unisons and mysterious, keening solos that finally coalesce into music that is intense, cathartic and beautiful. The ideas are forcefully stated and sharply contrasted, set forth in clear textures and resonant timbres that reveal a deep understanding of the medium’s expressive possibilities. 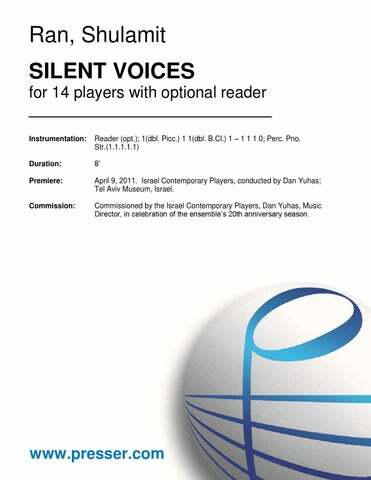 …a bold setting of Psalms texts in Hebrew, complete with crashing cymbals, surging choral outbursts and hauntingly sustained harmonies, yet always direct, sonorous and impeccably tasteful. …many beautiful moments and expressive gestures, quite appropriate for the text [from Deuteronomy and Psalms]. 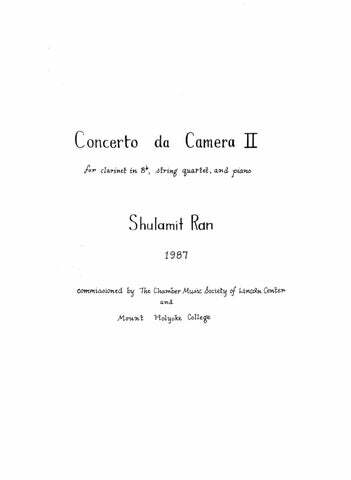 Ran’s work was radiant from the French horn opening solo to the spectacular percussion cadenza… This is a work that will reward each new listening. The “Symphony,” which won her the Pulitzer award… is immediately notable for its energy. It has a thrust to the thematic ideas that sets her phrases moving over a compelling pulse. …clear instrumental manner allows her to weave some tight musical ideas without letting her listeners miss any details, or lose the thread of her argument… it is music to exemplify an ideal — dramatic, colorful, clearly directed. The clarinet is the great mimic of the orchestra, with its extraordinary four-plus octave range… Ms. Ran exploits all of this… But even more remarkable was her extension of this mimicry through thematic recall and theatrical caricature. …the solo material seemed to evoke familiar roles in the instrument’s past. The clarinet, whether plaintive or shrill, never seemed to stray from assuming some theatrical character. … In various transformational moments, the clarinet, as dancer, materialized in a zesty tango; at another point, the protean soloist called to mind the storied opening glissando from Gershwin’s Rhapsody in Blue, as a riff artist in some jazzy ensemble, à la Bernstein; and finally was ushered off in what sounded like a terrifying reference to Shostakovich. It’s a big, important work, right down to the mock-Bach finale. Ran’s beautiful 18-minute opus certainly does its bit to welcome listeners into its orbit. The melodies are gracious and shapely, the form clear without being predictable, and the rhythmic language sparklingly brisk…the most alluring aspect of the new piece is the pungency and variety of its textures…a constantly shifting sonic landscape that is crisp and lyrically swirling by turns. The plaintive introduction of a soprano saxophone midway through sets the rest of the work in dazzling relief. “Under the Sun’s Gaze”…uses a rich palette of nine woodwinds, saxophone, strings, piano and percussion to create an absorbing evolution of starkly contrasted sounds moving from darkness to light and back again. In the course of the three interlocking movements, flute and violin dance a quirky duet; a folklike melody in flute and piccolo builds to an exultant blaze of sound as various instrumental layers are piled atop the tune. …summed up the evening’s brainy delight in musical complexity. …its raucous outbursts evoked a merciless noonday sun while its more languorous moments hinted at a Middle Eastern desert cooling into twilight. …deploys an inventive palette of nine woodwinds, strings, piano and percussion, often used in quirky combinations, to trace a sonic journey from darkness to light and back again. … full of percussive invention. …a distinguished work by one of our most gifted composers. A strongly felt piece in three contrasting movements, mercurial in mood and character, it made full use of [Shapira’s] virtuosity and big, expressive tone… virtuosic enough to qualify as a high-wire act, although its most distinctive feature was its strong, melodic emotionalism, from lingering melodies to big, difficult climaxes… Mr. Shapira played it with conviction, through to its beautiful, singing finish. 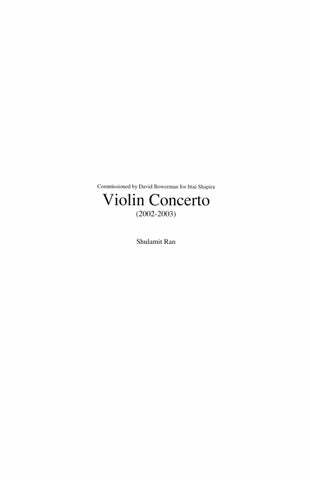 Ran intended that the concerto should explore various aspects of the violin’s soul. This she does in its devilish brilliance, its consolatory voice and its seductive honeyed song. A remarkably grateful and graceful vehicle, it explores the instrument’s expressive range with idiomatic sensitivity for 20 taut minutes. Shapira played it with silken tone and gutsy bravado. …memorable, and affecting. …it settles down and focuses on what it really wants to say, and expresses it clearly, economically, and passionately. On June 13 at Carnegie Hall, the infinitely versatile Orchestra of St. Luke’s presented the “Violin Concerto” by Israeli-born Pulitzer Prize winner Shulamit Ran, commissioned and performed by her compatriot Ittai Shapira. A strongly felt piece in three contrasting movements, mercurial in mood and character, it made full use of his virtuosity and big, expressive tone; his identification with this clearly very personal music spoke through every note. 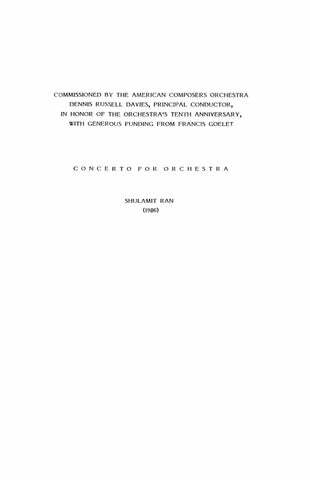 Ran’s orchestral writing in the concerto is just as alluring as the whirlwind solo line — darkly moving brass chords in the first movement, Bartok-like strings buzzing in the second. The third is a long aria of farewell, with winds, strings and brass joining the solo violin’s sad song like fellow mourners.